Reluctantly, I accepted that that it was time to let it go, so I set it outside our back door until I could get around to taking it over to the community garden and add it to the compost pile. Let me just say that I’m not always prompt about following through on the things I intend to do. Week after week the wilted peace lily sat outside our kitchen door suffering through the summer heat and thunderstorms. Then one day when I came up the outdoor steps to our kitchen it seemed to me the plant was looking perkier. Was it just wishful thinking on my part, or was a dose of nature just what it had needed? I didn’t know, so I didn’t meddle. I left the plant where it was, at the mercy of the heat and the rain and the wind. Sure enough, as the months went by the plant revived. It started putting forth new leaves. Shiny, vibrant leaves. Lots of them, and by the end of summer it was fuller and healthier than it had ever been. Then, before the first frost, I brought it back in and now it happily sits once more on its stand in the living room corner. There are lots of lessons I could take from this experience. I could let it remind me that there are times when procrastination isn’t necessarily a bad thing, because sometimes it provides just the time something needed to come into its own. Or I could let the saga reveal to me that it’s true what they say: what doesn’t kill us does make us stronger. I could also let the plant’s remarkable comeback remind me of the healing power of nature, of how much we need to leave behind our sheltered existence every now and then and expose ourselves to the elemental forces of the wind, the sun, the rain. But the lesson that is speaking to me most deeply at this time in my life is that the peace lily showed me that it was precisely when I gave up trying to save it that I gave it what it needed. Sometimes I’m tempted to think if I try hard enough I can bring things around. I can come to the rescue and pull troublesome situations back from the brink of disaster, or find a way forward in circumstances that are clearly hopeless. But I know that such saving efforts are often futile; more often than not they are simply the ego acting out its useless anxiety and need for control. The fact of the matter is that there are forces at play in my life that are simply not under my control, and sometimes the most prudent thing to do is to stop my striving, let go, and get out of the way. Now, from its corner in our living room, my peace lily teaches me on a daily basis of the paradoxical truth that there are times when I need to let go of the things I cherish most. Sometimes it’s the only way they can ever truly thrive. There are many in our species who are without a doubt NOT “Gardenly Attuned” for lack of a better description. I am one of them!! While my wife plants and gets great results, I can cause a flower to wilt from 40 paces. OK, I once again overstate but not much. So what I glean from your piece is that our Holley tree, which has suffered greatly through this past winter & is now covered in half brown leaves should basically be left on its own. It neither needs nor wants our hand wringing attentions. Therefore, to give it the best chance for recovery, I shall refrain from gazing upon it from any distance. Hopefully, it will pull through. This winter was rough on so many plants, including a wonderful fig tree at our community garden that looks completely dead, though some people are saying the roots are still alive and the tree will come back. I hope so. Perhaps the same will hold true of your Holly. 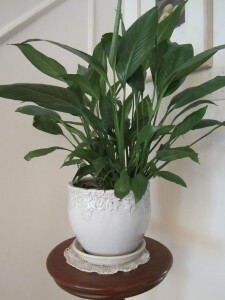 Thank you so much, Patricia, for your post about the peace lily. It was exactly what I needed to hear this morning. There are troubling situations taking place within my family and my usual response is how can I fix this. Even though past experience tells me that I can’t fix or control anything outside of my own actions I continue to stress about decisions made and consequences that follow. I need to allow time for healing knowing that with God all things are possible. Thanks again. Pat, I understand. It really can be extremely difficult to “leave well enough alone” when it seems things *aren’t* “well enough.” It’s also harder, I think, the closer you are to the situation. I wish you all the best. May the clarity and peace in your own center be your gift to those you love. Hi Patricia: After arriving home yesterday from my visit with you which meant so much I found my orchid (a month old) without a gorgeous petal. It looked so dismal. My sister felt badly but I knew it wasn’t her fault. It looks so empty but I know it has more beauty in it and will bloom again. Maybe it was feeling badly at my absence! But with your thoughts which told me more about my life than just the failing orchid I shall wait and put it in a safe environment and wait for the future. Meanwhile I’ll go about my life and give it a sneak peak or two and let it do what it wants to do. Your thoughts brought me hope for more than a blooming orchid. Many thanks. Sue, I’m glad the thoughts and story about the peace lily were helpful. I’ve never grown orchids myself, but I know that when they finally bloom again it’s always worth the wait! It was wonderful seeing you, and I look forward to the next time.